The lab will serve as a learning hub and classroom for cybersecurity students, and will serve as the practice center for Hack@UCF. 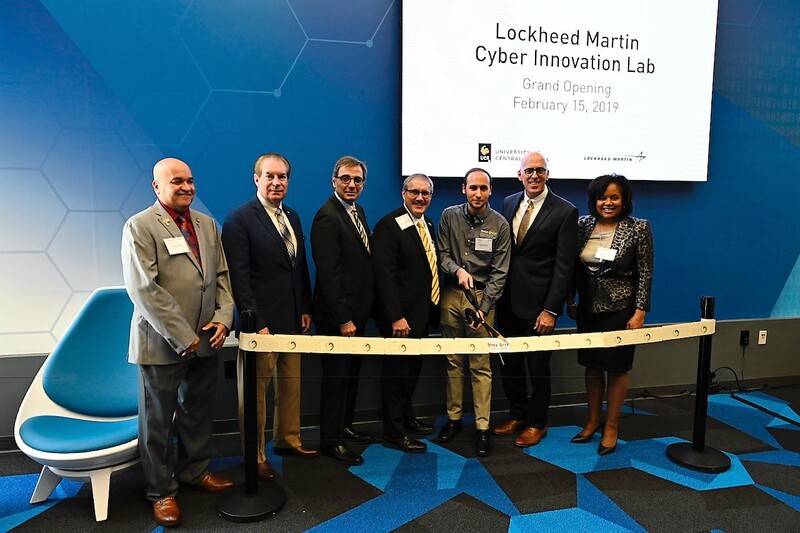 The lab’s opening was celebrated with a ribbon cutting, a demonstration by UCF’s Collegiate Cyber Defense Club (Hack@UCF) and a panel discussion with U.S. military and Lockheed Martin cyber experts about technology trends and how students can prepare for a career in the growing field. The 970-square-foot lab is in the atrium of UCF’s Engineering I building and will serve as a learning hub, classroom, and the practice center for Hack@UCF. In November 2018, Lockheed Martin donated $1.5 million to UCF to help create the Cyber Innovation Lab and encourage the next-generation of science, technology, engineering and math (STEM) talent to collaborate and solve today’s challenging cyber problems. The company’s donation will fund software and technology support to the lab, and employees will also provide cyber training and professional mentoring to engineering students. UCF provides more graduates to aerospace and defense companies than any other university in the country, and UCF continues to grow cyber research and education through its Cyber Security and Privacy Faculty Cluster, an interdisciplinary research team focused on comprehensive solutions to human and technological causes of security and privacy problems. It’s estimated by the National Institute of Standards and Technology that there are more than 13,000 unfilled cybersecurity jobs in Florida alone, and the U.S. Bureau of Labor Statistics predicts jobs for information security analysts will grow by 28 percent by 2026. UCF rose to national prominence in cyber defense education when Hack@UCF won three back-to-back championships in the National Collegiate Cyber Defense Competition in 2014, 2015 and 2016. Hack@UCF also in 2018 won the U.S. Department of Energy CyberForce Competition. The student club, with more than 350 members, continues to dominate in collegiate competitions throughout the country. In 2016, UCF was named as a National Center of Academic Excellence in Cyber Defense Education by the National Security Agency and the U.S. Department of Homeland Security. The designation, which brings prestige and additional access to scholarships and research grants to UCF, comes under a federal program that’s meant to reduce the vulnerability of the nation’s information infrastructure by strengthening higher education and research in cyberdefense.